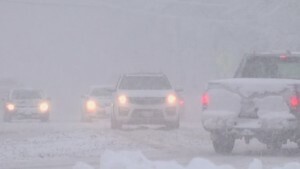 San Francisco (CNN) -- The Pacific coast's strongest storm in years pummeled California and Oregon on Thursday, leaving at least one man dead and knocking out power in urban areas. Phillip Crosby died when a tree fell on the tent where he was sleeping in south Oregon, said the Jackson County Sheriff's Office. Crosby's 18-year-old son, Alexander Crosby, tried to revive his father, the sheriff's office said. Alexander Crosby told officials the falling tree was 8 to 10 inches in diameter and partially struck Phillip Crosby across the arm and chest. The Crosbys were from Sunny Valley but were homeless and on their way to Arizona, authorities said. Portland General Electric said about 18,000 customer lost power and Pacific Power (Oregon) said 32,000 lost power. An estimated 225,000 customers lost power from northern California to the Canadian border, a CNN survey of power companies showed. Almost 2.5 inches of rain Thursday helped cause those outages in California, but much heavier rainfall besieged other areas of the state, including 14.6 inches in the Petrified Forest. The rain will alleviate three years of a historic drought in the nation's most populous state, but it's not being gentle. Schools pre-emptively closed Thursday in San Francisco and Oakland. Flightaware.com reported 236 flight cancellations at San Francisco International Airport -- 40% of the day's 589 cancellations nationwide. Street traffic was dicey, too. Brandon Ball, a CNN iReporter, said he flew into San Francisco Thursday morning and and got stuck in a cab on U.S. Route 101. 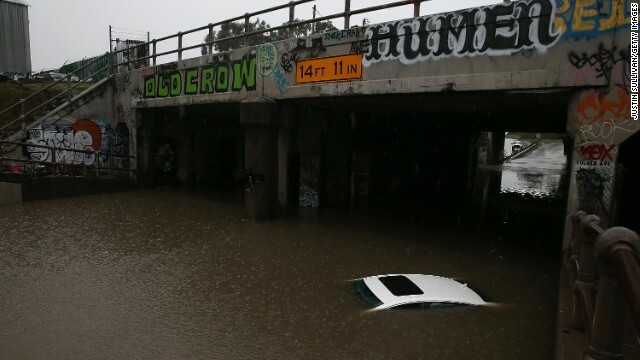 "Right before approaching Bayshore Boulevard, the freeway was completely flooded on both the north and southbound side, with multiple cars stuck in the water, and the respective vehicle owners sitting inside," the Los Angeles resident said. "Cars were passing through the flooded waters in a single-file line, with authorities doing their best to guide them through." A ferry ride across the bay seemed more like a flight in turbulence. "It was pretty bumpy. I swear we were airborne, up and down, everyone in great spirits and laughing. No normal ferry ride today," said commuter Mark Montemayor. Service was suspended on many ferry routes. Jose Lopez couldn't open his downtown San Francisco restaurant, a victim of the blackout. "No, we cannot. It's a safety issue," he said. "Certain corners are blocked off, so we can't do that." In the mountains, wind gusts were so furious that the typically smooth waters of Lake Tahoe roiled with waves, prompting Californians to do what comes naturally to them: go surfing. Gusts reached 49 mph there late Thursday and were forecast to roar at 120 mph overnight. Winds of 89 mph were reported in Sea Lion Caves, Oregon, said Matthew Cullen of the National Weather Service. Portland recorded gusts of 67 mph, the strongest wind recorded at their local airport since 1971. In San Jose, a Safeway Supermarket's roof partially collapsed and injured one customer who slipped while running, Fire Chief Mitch Matlow said. The customer suffered a minor leg injury and did not go to the hospital, Matlow said. The chief said he didn't know what caused the roof to collapse. "We had a helicopter fly above the building and they were able to estimate that the hole was about 50 feet by 50 feet," he said. "There was no standing water observed but that does not mean that it wasn't caused by water." In Sebastopol, Francisco Lozano lamented how it was only two weeks ago when he left Idaho and "an epic snowstorm" and now he found himself in California's "epic rainstorm." "I need to go out and buy a raincoat. I only have a snow coat," said Lozano, a CNN iReporter who posted a video of a flood approaching a Highway 12 bridge in Sonoma County. Flood warnings were issued for major waterways, leading residents to scramble for sandbags. 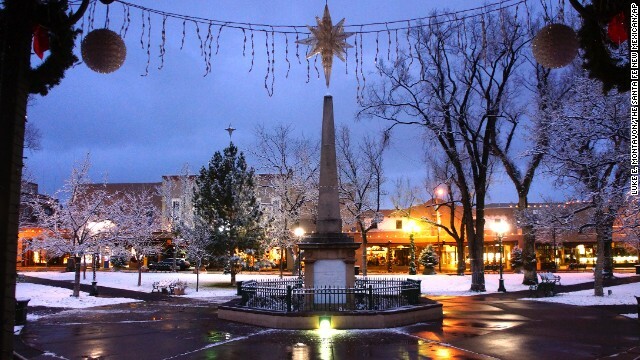 The plaza in Santa Fe, New Mexico, is blanketed with snow on Sunday, December 14, following snow showers from a storm system that slammed California and moved into the area. 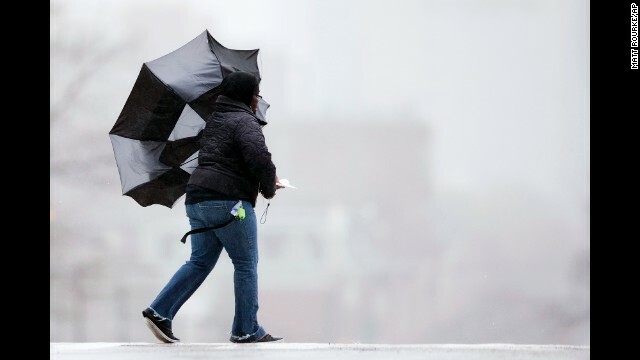 A powerful storm that has been lashing Northern California has moved southward as weather systems whip rain and snow at the West Coast and inland areas. 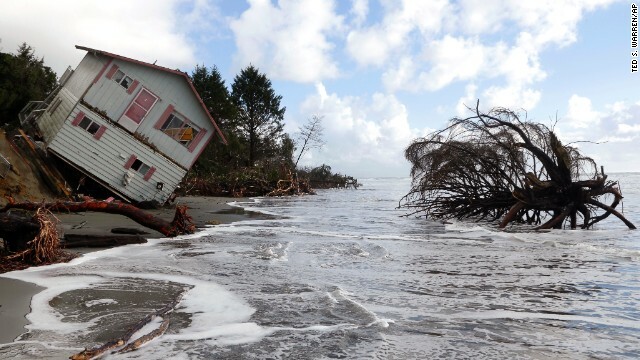 A two-story house leaning over the eroding ocean shoreline of North Cove, Washington, is seen on Friday, December 12, as the tide rises. 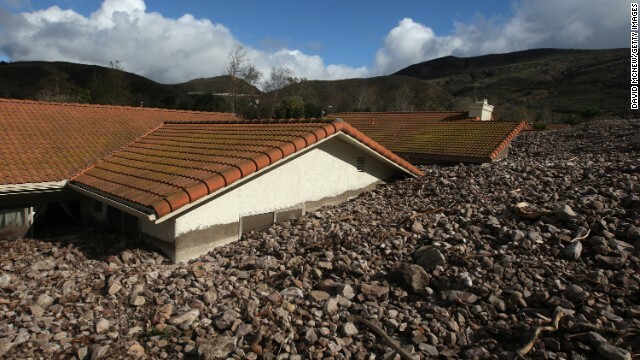 Homes are covered with rocks and mud after debris flows smashed into houses on December 12, in Camarilla, California. 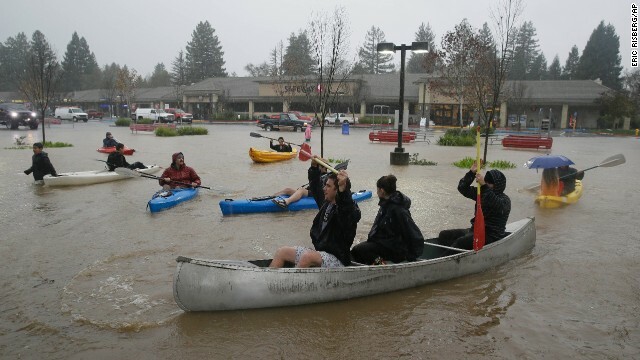 People in kayaks and a canoe make their way around a flooded parking lot at a shopping center on Thursday, December 11, in Healdsburg, California. 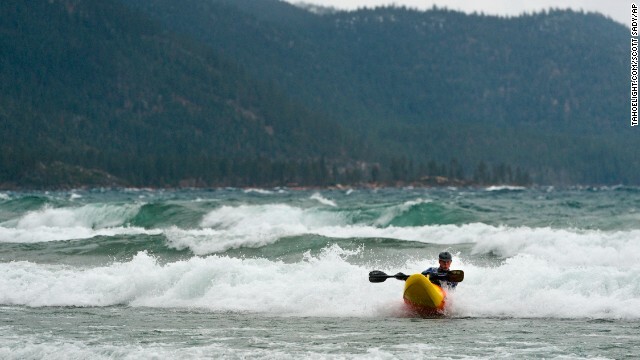 Pete DeLosa paddles his kayak through tall waves on Lake Tahoe, kicked up by a strong storm moving across California and Nevada on December 11. Only the roof of a car is left visible as it sits underwater in a flooded section of Ashby Avenue on December 11 in Berkeley, California. 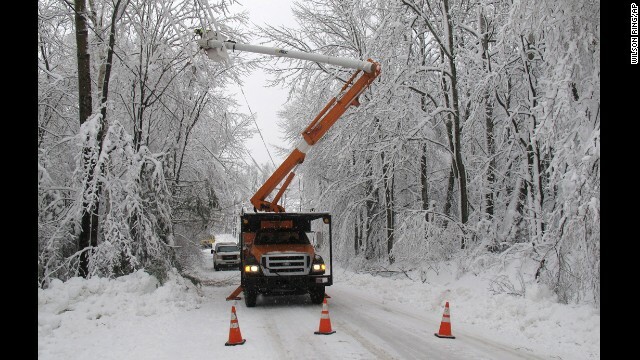 Green Mountain Power cuts limbs overhanging power lines in Waterbury, Vermont, on December 11. 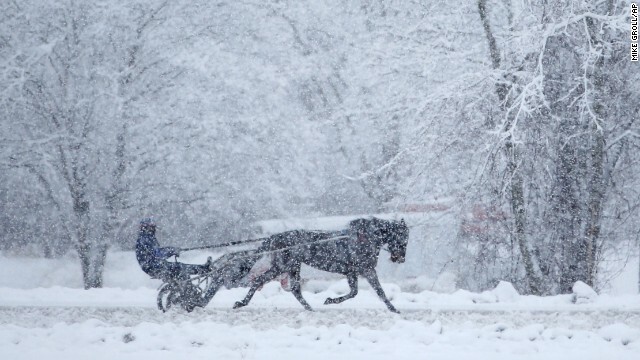 A horse and driver train on a harness track on December 11 in Saratoga Springs, New York. 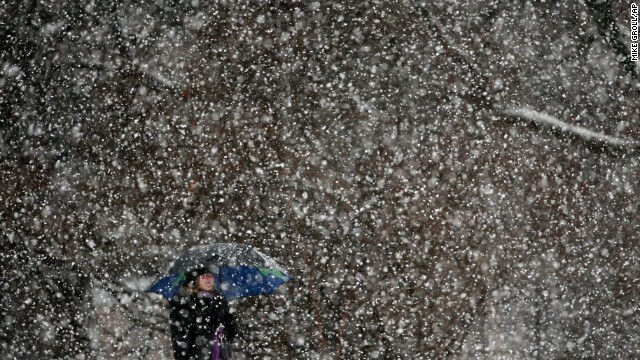 A woman walks through snow in a park in Albany, New York, on Wednesday, December 10. 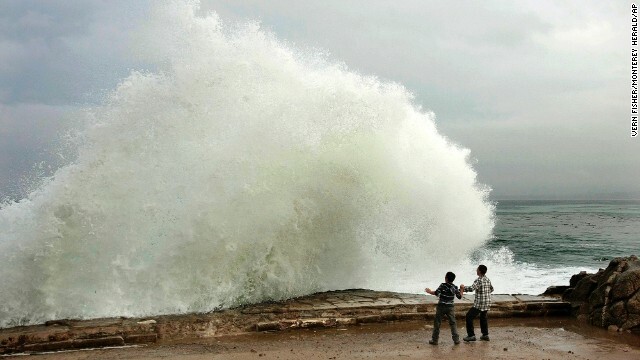 Waves break December 10 on Ocean View Boulevard in Pacific Grove, California. 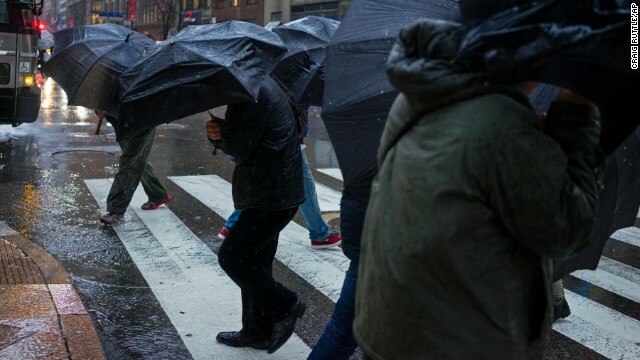 People carrying umbrellas cross a street in New York City on Tuesday, December 9. 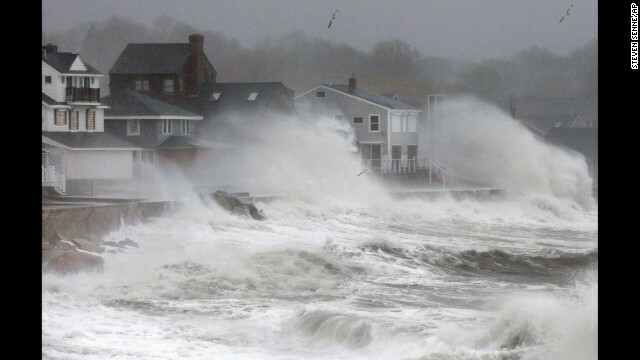 Waves splash against a seawall and onto houses in Scituate, Massachusetts, on December 9. A woman's umbrella is blown back by winds in Philadelphia on December 9. 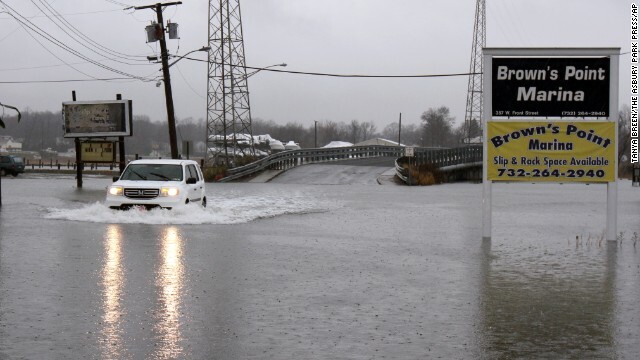 An SUV braves a flooded street in Keyport, New Jersey, on December 9. A car sits partially submerged in floodwaters in Hemet, California, on Thursday, December 4, after overnight rains doused the area. 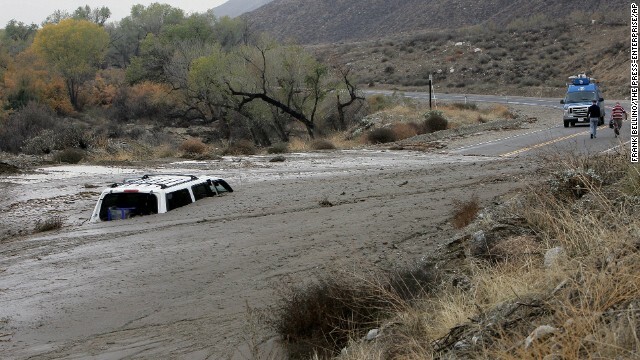 A television news crew walks away from a vehicle caught in an overnight mudslide in San Jacinto, California, on December 4. 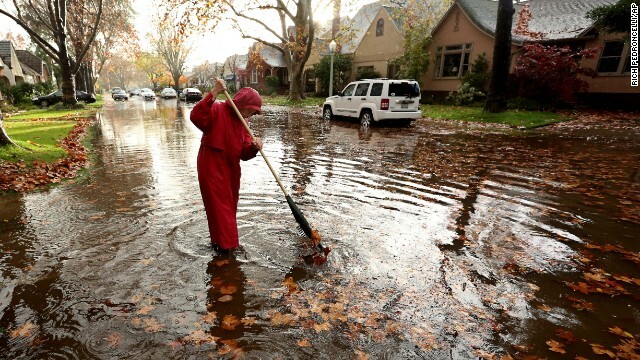 A woman stands in knee-deep water as she clears a clogged storm drain that had caused her street to flood in Sacramento, California, on Wednesday, December 3. 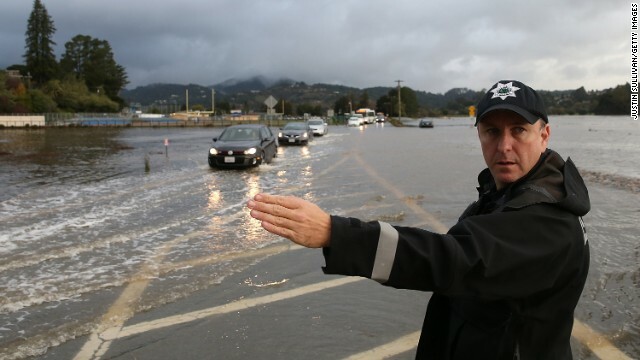 A police officer directs cars through a flooded section of a roadway December 3 in Mill Valley, California. Almost 8 inches of rain doused Guerneville on Thursday morning, and the Russian River there is expected to flood homes and businesses Friday morning and crest by Friday afternoon. The river is forecast to fall below flood stage Saturday morning, the weather service said. Meanwhile, 4.64 inches of rain fell on St. Helena, and the Napa River there was forecast Thursday afternoon to crest near 18.8 feet, a mark of moderate flooding expected to cause widespread crop losses and erosion of land and many primary roads, according to the National Weather Service. The Napa River was expected to fall below flood stage by Thursday evening. 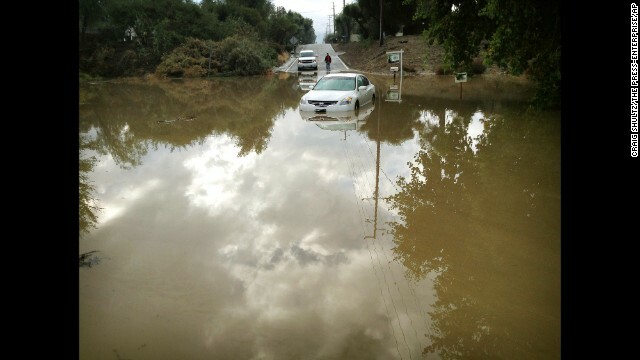 In Rutherford, California, Alpha Omega Winery had to close because of 8-10 inches of water in the parking lot, assistant winemaker Jaime Dowell said. "We had nowhere for customers to park, so we closed around 11 a.m. this morning," she said. The 8-acre winery is about 30 minutes outside of Napa, Dowell said. "We are used to flooding in this area because we are on a flood plain and the ground is clay so it acts like a pan and floods quickly," she said. "We have even seen ducks swimming across our vineyard before, but the parking lot flooding is new." From Crescent City to San Diego, plus many points inland, the Golden State is expected to be inundated with precipitation and hit with potentially perilous winds in spots. Three-digit wind gusts were confirmed throughout California's peaks: 139 mph on White Mountain, 135 mph on Mount Lincoln, 112 mph on Slide Mountain, 111 mph on Mammoth Summit and 109 mph in Alpine Meadows, the weather service said. Heavy snowfall is forecast to continue Thursday night into Friday in the Sierra Nevada and wind gusts are expected to exceed 60 mph Thursday, according to the National Weather Service. Snow has covered Interstate 80, the main route through the Sierra Nevada, but the road open for vehicles with maximum chains. On the coast, San Francisco recorded 50 mph gusts and Oakland 48 mph, the service said. 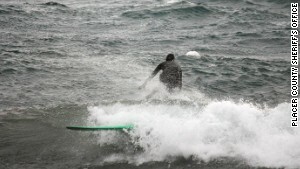 A surfer rides Lake Tahoe. A winter storm warning projected up to 3 feet of snow along the Sierra crest by Friday, the weather service said. 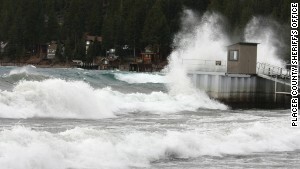 Strong winds roil Lake Tahoe. Forecasters expect some higher elevations north of San Francisco to get 10 inches of rain, a gushing fit for a tropical island, but a dramatic and drenching change for a state that is almost entirely experiencing exceptional drought. Given all the problems that three years of drought has caused -- draining reservoirs, threatening farmers, driving up food prices -- most any wetness is welcome. But when it comes down so much, so fast, it can be dangerous. Thursday's rain came on top of what fell the previous evening, when parts of Northern California got half an inch per hour. And it's going to stick around for a while, leading to flash-flood watches through Friday evening in some parts of the state. The fact that this all comes as part of a powerful massive storm brings another set of problems: Parts of the Sierra Nevada, for instance, are under a blizzard warning amid forecasts of heavy snow in the mountain chain, coupled with winds that could gust as strong as 80 mph. In fact, the majority of California and much of neighboring Oregon are under high wind warnings. Sustained winds of 15 mph and stronger, paired with gusts up to 70 mph, could knock down tree limbs, delay air travel and rock some of California's signature bridges. Much of this moisture, at least along the California coast, comes from an "atmospheric river," a band of heavily moist air that split off from a larger such band at the tropics. It's as if a river in the sky broke its banks, sending a new tributary 250 to 400 miles wide northeastward to California. It will soak the state Thursday, and when it hits the state's eastern mountains, it will fall as snow -- lots of it. Still, the latest onslaught could be the worst. Residents and officials are taking precautions. In addition to several Bay Area districts closed schools on Thursday, and some on Friday, commuters and those just trying to get around the area were affected as well. The San Francisco Municipal Transportation Agency announced on its website the cancellation of ferry services and the suspension of service on the Muni Cable Car lines. Shuttle buses are running instead along the cable car routes "until further notice," the agency said. The San Francisco Police Department closed parts of Embarcadero Drive near San Francisco's Fisherman's Wharf because of water that went over a seawall there. The series of fronts and the jet stream won't just be battering places like San Francisco. They will also affect areas farther down the California coast in Big Sur and all the way up the West Coast in northern Washington state. In Gold Beach, Oregon, Don Kendall with Curry County Emergency Services said, "We've had the kind of winds and surf that will chew up boats. We didn't have crab boats out. We had 28-foot seas at 15 miles out. We had about three and a half days of 50-to-70 mph winds." In Portland, two pieces of folded sheet metal about 20-by-6 feet went flying through Portland's busy financial district during rush hour on Thursday, Lt. Rich Tyler, a public information officer with Portland Fire and Rescue said, but nobody was injured. Tyler said the sheet of metal became dislodged from an upper floor of Portland's PacWest Center on Southwest Fifth Avenue. The metal remained airborne for about a block until it hit the 14th and 15th floors of the Portland Standard building, Tyler said. He said the metal broke about eight windows on the building, causing glass and debris to fall to the sidewalk. Despite hundreds of people being on the 14th and 15th floor as well as on the sidewalk, nobody was hurt, Tyler said. An apartment building wall partially collapsed Thursday afternoon in the northwest part of the city and landed on parked cars, said Lt. Damon Simmons, the public information officer with Portland Fire. It wasn't immediately clear if wind caused the damage. Nobody was hurt, he said. Oregon Bureau of Land Management reported via Twitter, "Our Yaquina Head Lighthouse in Newport, OR is recording wind gusts over 80 per hour!" Forecasters are warning that gales could push waves up over 20 feet high along the West Coast. Fort Bragg in California will get hit from two sides, with up to 5 inches of rainfall by late Thursday and breakers up to 24 feet pounding the shores, the weather service said. Far from the shore, in Sacramento, there will be no respite from the storms and the wind, with many inches of rain and 80 mph gusts in the forecast. And just a few miles farther inland, at frosty high elevations, the downpours will transform into a blizzard, decking the peaks of the Sierra Nevada in snow 6 inches to 2 feet deep. CNN's Steve Almasy, Dave Alsup and Greg Botelho contributed to this report. Ben Brumfield wrote and reported from Atlanta, and Michael Martinez from Los Angeles. Dan Simon and Sara Weisfeldt reported from San Francisco.